Born and raised in the south Florida heat of Miami, I graduated from Monsignor Edward Pace High School in 2012. 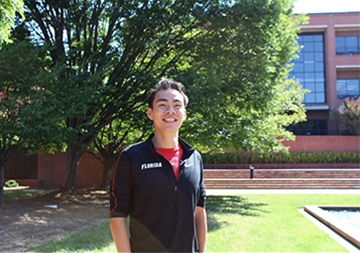 During my time as an undergraduate at the University of Florida, I had the opportunity to serve as a student manager for the universities track and cross-country teams. While at UF I conducted research focusing on developing biodegradable fibers for drug delivery applications. I also had the chance to pursue multiple internships with Medtronic. Upon graduating from UF in 2017 I had the honor of being named a GEM Associate Fellow. My goal is to work in an athletic apparel or medical device company. Biomaterials, drug delivery, thermoelectric materials, medical devices, wearables, smart textiles, energy harvesting, materials characterization. My current research involves characterizing and integrating thermoelectric materials to create self- powered wearable technologies that can be used for electrocardiography (ECG). Our goal is to develop a shirt that is comfortable, can measure ECG signals, and is self-powered by ones’ body heat.